Lemonade Makin' Mama: GIVEAWAY from my friends! I so enjoy your blog! I'm all about "keepin it real"!!! So thank you! The give away items are all so, so lovely! I've purchased a cuff for a friend from Farmgirl and it was adorable!!!!! I loved the personal aspect of it! I don't know the other ladies or their products! But am going to check them out!, always excited about discovering new places to shop! !exterminator can find the stench!!! Whatever it is that The Lord is calling you to the "Brave-thing" He will bring you through!!! He is always so faithful! We only need to trust! I am unsure about if we leave our comment of encouragement here, or on their blogs or websites, but I'm assuming it's here. Megan, Amber, Becky, and Heather, (and you too Sasha! ), are all so inspiring. If I feel stuck, or uncreative, I just have to browse through your work, and I am instantly inspired again! Don't ever stop doing what you do. I have been reading you're blog for a few months and im addicted. You all are so encouraging. Thank u for all the time and effort u put into this. Love your blog. Would just love to win these amazing treats! I am hoping to order a bracelet from farmgirlpaints soon. I just love to come to your blog to rest my eyes on beautiful photos and my heart on sweet and gentle words. Thank you as always, Sasha, for sharing your life! Each of the women who are brave enough to create and share the lovely things they make, are a constant inspiration to me. I'm excited to see how these gals take God's ingredients and mix and stir them into brand new works of art! Meagan, heather, Becky and Amber, your works is beautiful. Thanks for the giveaway opportunity. I'm so inspired by you, and by the creativity of these ladies...thank you for this giveaway! Sasha, Megan, Amber, Becky, and Heather, are all so inspiring. I have been blessed by reading your blogs/instagram posts! What a super give away. You are all so very talented. Thanks for sharing your gifts!! Love every.single.thing. I facebook'd the giveaway. I've been looking for something encouraging to send to a friend who had a stroke almost 2 years ago. I know she is feeling down and I think a print from Heather at Life Made Lovely might just do the trick. Heading there now to check it out. I love seeing the awesome creativity abilities the Lord has given each of us. Especially you 4 ladies a part of this giveaway. Just instagrammed the giveaway. Can't wait to hear more about your braveness! I just pinned your giveaway to share it....oh man now I need to go look at the jewelry...and as for your shop...can't wait for your new stuff! I purchased the cow print for my mom for Christmas and she ADORES it....and Becky at FGP is my fave, only have one of her cuffs but I plan to buy more someday! I adore Becky's cuffs ~ I have 3 now! The items here are all gorgeous ~ what a lucky girl you are to have these ladies as friends ~ please throw my name in the hat for the giveaway. Cannot wait to see your new items when your shop reopens next week. I am tweeting this as well! Goodness sake. I was just thinking that I hadn't heard a peep out of you in a while. Glad you're back & glad Adrain's home safely! Sounds like you had quite a week. Can't wait for your shop to reopen. This giveaway is wonderful!! What an amazing group of goodies. Can't wait to see your shop! Love all these goodies! Such talented ladies. :)Thanks for the giveaway! Megan, Becky,Heather, Amber and Sasha you are a great group of talented ladies. Thank you for the giveaway! These are all wonderful giveaways! Thank you to you and your friends! Love them all... especially the cuff. I have just started following your blog - it is a true delight to read your posts. I would love to win your giveaways - each one of the gifts are so unique and special. Thank you for your encouraging words. What a beautiful giveaway from from really talented women! All great gifts and a great giveaway. Good luck on your shop opening. Such beautiful things! Looking at them is almost as good as getting them would be! Off to check out their sites and do some more window shopping! No idea why I'm unknown. Should say Sarah Dawkins! Beautiful items...each and every one of them! 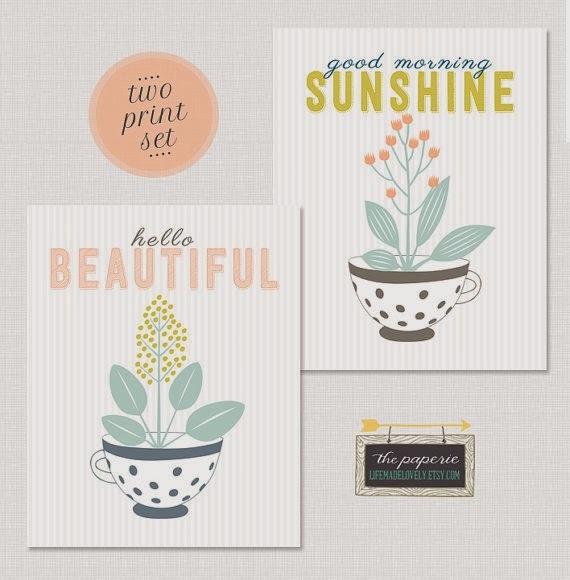 I have had the Good Morning Sunshine print pinned for a while now thinking I might purchase it to put in my kitchen near my coffee maker. Thanks for introducing a few new companies to me too! We have had the occasional dead mouse in our walls before and that's enough to make one room smell terrible...I can't imagine the entire house! I hope they find it! As we grow older women are our go to's for product advice, style advice and any other kind of advice. Hats off to these ladies for making pretty things to keep life pretty! I love everything on this list! How great. Farmgirl Paints, cuff! I have wanted one of those forever. So great! Beautiful items. Love that they are all handmade! I love the creativity of these very talented women....everything is so pretty. Thank you for sharing them along with your heart. Hope you have a great weekend enjoying your man being home! So amazing how someone i don't know can create *just the thing* i most need to hear or be reminded of. So glad all of you are brave enough to share your talents. Thank you!!! What an awesome group of talented ladies! Everything is so beautiful! I wish I was as creative as all of you! Hope you find what is stinking up your home. Have blessed weekend! What a wonderful gift of creativity the LORD GOD has blessed each of you ladies with! Everything is so lovely!! Thanks for the great giveaway! May the LORD bless you for your generosity and thoughtfulness!! What beautiful things! It would be a delight to win this giveaway and be the recipient of so much lovely goodness. Good job, creators! Such lovely little things....so thoughtful of you! Amazing lady artists! Thanks for sharing their talent!! I love any and all homemade things! The creative gene skipped me. These items are terrific and I can't wait for your shop to open!! These ladies are all so talented and generous with their gifts. It would be a blessing to win all of this wonderful stuff. You are speaking my language once again, Sasha!! My honey left me this week and both his girls were a mess! As we were driving to the airport to drop him off, both of us at our wits ends with our girl, me sobbing, he asked me if he could PRAY!! What better gift could he have given - NONE! To be placed right back in the hands of God for protection is the ONLY place I want to be when weathering these storms. I am so thankful for friends like you who are transparent! It sure helps to know you are not alone sometimes! Here's to ya opening your store - can not WAIT to see what beautiful things you have been creating! P.S. I am off to pick me up some testosterone in the shape of my buff man - HA! Love this giveaway! Such beautiful things! Thanks to all the super talented and generous ladies who've made something with their own hands and then gave it away. So sweet! I look forward to each and everyone of your posts. You are always so inspiring! My hubby was also out of town this week...it is hard...isn't it?! It was nice to know that other mommas have a hard time keeping it together when their other 1/2 is away! Oh, I love every single part of your giveaways this month. What talented ladies! I love anything handmade :). Love every item, plan on using the coupon codes this week! God sure has blessed y'all with some talent! Such talent displayed in this giveaway as well as generous spirits. Hope they've figured out what's causing the smell by now. Sasha, Megan, Amber, Becky, and Heather LOVELY Work All of you!!! Thanks for your graciousness in this giveaway! Love the love items in the give away. You are so blessed to have a spouse who adores you and knows what you need to comfort when distance is between you. I hadn't "met" the first one…so thanks for the introduction! 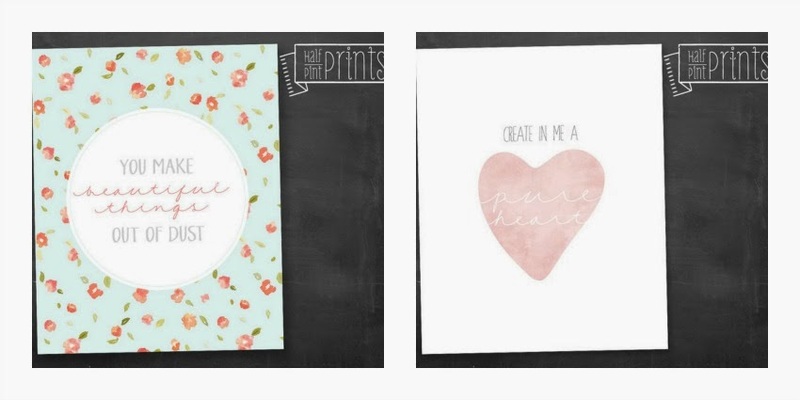 This whole collection just speaks encouragement to me, and I sorely need it! From the sparkle of the earrings to the words and beautiful images on the cuff and prints. Thank you for hosting this giveaway! And I can't wait to browse your shop on Wednesday! I've missed hearing from you, Sasha. Thank you for sharing these talented women with me. What a wonderful use of God's gifts. your be brave thing... YOU'VE GOT IT! and i LOVE all those creative & generous woman! and yeah... what did happen with that smell? please tell me it went away? Traveling is not easy on a family, I do it way too often to know. I am envious of these wonderful ladies talent. And so grateful for theirs and yours willingness to share. Beautiful products, beautiful people. Thanks for the contest. Oh yes you can, y'all! Lovely artistic women turning their talents into treasures for other women to share! Such pretty lovelies! And the women creating these lovelies are beautiful! I love the simplicity in all of these treasures. Thanks to each of them for spreading the lovely around...we all need more of it! The creativity of these ladies...as well as you, is mind boggling. Truly. Thanks for the chance to win and I am hoping the source of the smell is removed soon...been there before and it is awful! Have a lovely week. I am inspired by the creativity and beauty of these women! Such creative and gifted ladies! So glad they are sharing their gifts with us! This is great! Your heart is so sweet!! What sweet, beautiful items! Best wishes on your shop reopening! What a beautiful set of items! Would love to win this giveaway! I thank all of you wonderful women for the opportunity! Oh, I just love Becky's cuffs and would love to have a sparkly silver one. Great way to add some sparkle to any day. I love all of these beautiful and inspiring pieces! Wow, how generous a giveaway! I also pinned this giveaway! What can I say? I really hope to win! Amen! Haha. Such an awesome group of prizes! So much prettiness! Best of luck on your new venture! I love all these and including you LMM hard creative Gals very inspiring each in a very special way! I love all these woman and follow most of them on instagram...I love your shop as well. I have some wonderful goodies from you. Oh, I'm already a big believer in your shop and Becky's, so thank you for the opportunity. And now I'm off to check out the other sites…especially the bling! Here's wishing you a great week. eeep!! what a great giveaway! farmgirl paints is one of my favorite shops! and, life made lovely makes amazing beautiful prints! so excited to see the other shops! Just shared the giveaway on IG under my name @happythis. Great giveaway! Each of their creations is a blessing in its own! FGP is one of my most favorite shops. Such beautiful artisans you ALL are. Creating from your hearts. Just love it and so grateful for the encouragement and inspiration you share with so many. Encouraged by the love & support you give one another. It is pure light. Thank you beauties. Wow! so much amazing talent - what fun giveaways! Thank you for sharing the gifts that God has obviously given you!! I just pinned those lovely rhinestone studs. I love them!! Love the creativity of these women! Way to go!! What a lovely collection for a give away! Stunning pieces from talented women! Thank you so much for the opportunity with this amazing giveaway! They are all so talented, and I absolutely love their Etsy shops! I shared this giveaway on my facebook page southern rhodes design! I posted about your blog and these giveaways on my blog today. Great giveaway! I told my followers over on instagram to check this giveaway out! I love to see what other talented women are doing out there. I have passed the word along about this giveaway on twitter! Thank you for the chance to win some great items before Valentines Day! I repinned this post on pinterest!